Runaway Helpline is all about you. Your stories. Your opinions. We want to hear them. Do you have experience of running away, being away from home or return interviews? We want to hear your stories and work with you to use them to help others who are in a similar place to where you were then, or where you are now. Hearing stories and experiences of other people who have been through similar things to you can help make us realise that we are not alone. Sharing your own story can help work through a difficult situation. 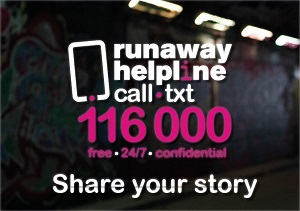 If you want to share your own story email 116000@runawayhelpline.org.uk or tweet us @runawayhelpline for more information. Do you have a true story to share about a time when you ran away or wanted to run away? ?